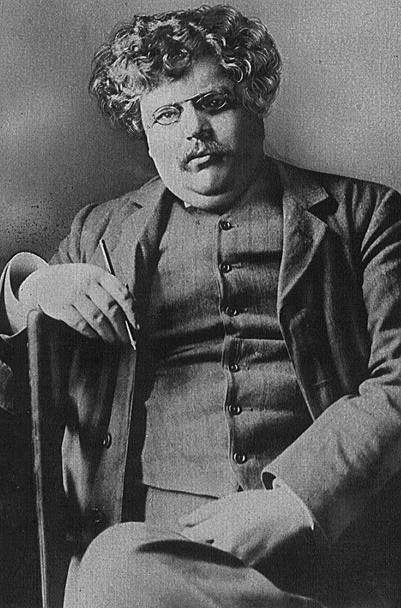 Gilbert K. Chesterton was a famous Writer from England, who lived between May 29, 1874 and June 14, 1936. He became 62 years old. He worked as a journalist in liberal newspapers, but refused to be put in the category as either liberal or conservative. He converted from the Anglican to the Catholic Church in 1922, and unfolded a diverse authorship, whether Christian topics. He is best remembered for her 48 detective novels about the seemingly naive detective Father Brown, but also wrote detective with the other protagonists. John Dickson Carr novel detective Gideon Fell is said to be a portrait of GK Chesterton. He is born under the zodiac gemini, who is known for Communication, Indecision, Inquisitive, Intelligent, Changeable. Our collection contains 112 quotes who is written / told by Gilbert, under the main topics: Art, Health, Intelligence, Sports. "Art, like morality, consists in drawing the line somewhere"
"Artistic temperament is the disease that afflicts amateurs"
"Being "contented" ought to mean in English, as it does in French, being pleased. Being content with an attic ought not to mean being unable to move from it and resigned to living in it; it ought to mean appreciating all there is in such a position"
"Brave men are all vertebrates; they have their softness on the surface and their toughness in the middle"
"Buddhism is not a creed, it is a doubt"
"Chastity does not mean abstention from sexual wrong; it means something flaming, like Joan of Arc"
"Christianity has not been tried and found wanting; it has been found difficult and not tried"
"Compromise used to mean that half a loaf was better than no bread. Among modern statesmen it really seems to mean that half a loaf; is better than a whole loaf"
"Courage is almost a contradiction in terms. It means a strong desire to live taking the form of readiness to die"
"Happy is he who still loves something he loved in the nursery: He has not been broken in two by time; he is not two men, but one, and he has saved not only his soul but his life"
"How you think when you lose determines how long it will be until you win"
"I owe my success to having listened respectfully to the very best advice, and then going away and doing the exact opposite"
"I regard golf as an expensive way of playing marbles"
"I was planning to go into architecture. But when I arrived, architecture was filled up. Acting was right next to it, so I signed up for acting instead"
"I would maintain that thanks are the highest form of thought, and that gratitude is happiness doubled by wonder"
"I've searched all the parks in all the cities and found no statues of committees"
"If a thing is worth doing, it is worth doing badly"
"If I can put one touch of rosy sunset into the life of any man or woman, I shall feel that I have worked with God"
"Let your religion be less of a theory and more of a love affair"
"Love means to love that which is unlovable; or it is no virtue at all"
"Lying in bed would be an altogether perfect and supreme experience if only one had a colored pencil long enough to draw on the ceiling"
"Man is an exception, whatever else he is. If he is not the image of God, then he is a disease of the dust. If it is not true that a divine being fell, then we can only say that one of the animals went entirely off its head"
"Man seems to be capable of great virtues but not of small virtues; capable of defying his torturer but not of keeping his temper"
"Marriage is an adventure, like going to war"
"Men always talk about the most important things to perfect strangers. In the perfect stranger we perceive man himself; the image of a God is not disguised by resemblances to an uncle or doubts of wisdom of a mustache"
"Men feel that cruelty to the poor is a kind of cruelty to animals. They never feel that it is an injustice to equals; nay it is treachery to comrades"
"People who make history know nothing about history. You can see that in the sort of history they make"
"Ritual will always mean throwing away something: destroying our corn or wine upon the altar of our gods"
"Science in the modern world has many uses; its chief use, however, is to provide long words to cover the errors of the rich"
"Some men never feel small, but these are the few men who are"
"The aim of life is appreciation; there is no sense in not appreciating things; and there is no sense in having more of them if you have less appreciation of them"
"The Bible tells us to love our neighbors, and also to love our enemies; probably because generally they are the same people"
"The Christian ideal has not been tried and found wanting. It has been found difficult and left untried"
"The cosmos is about the smallest hole that a man can hide his head in"
"The family is the test of freedom; because the family is the only thing that the free man makes for himself and by himself"
"The paradox of courage is that a man must be a little careless of his life even in order to keep it"
"The perplexity of life arises from there being too many interesting things in it for us to be interested properly in any of them"
"The poor have sometimes objected to being governed badly; the rich have always objected to being governed at all"
"The present condition of fame is merely fashion"
"The purpose of Compulsory Education is to deprive the common people of their commonsense"
"The simplification of anything is always sensational"
"The traveler sees what he sees, the tourist sees what he has come to see"
"The trouble with always trying to preserve the health of the body is that it is so difficult to do without destroying the health of the mind"
"The true object of all human life is play. Earth is a task garden; heaven is a playground"
"There is nothing the matter with Americans except their ideals. The real American is all right; it is the ideal American who is all wrong"
"Thieves respect property. They merely wish the property to become their property that they may more perfectly respect it"
"Those thinkers who cannot believe in any gods often assert that the love of humanity would be in itself sufficient for them; and so, perhaps, it would, if they had it"
"To be clever enough to get all that money, one must be stupid enough to want it"
"To love means loving the unlovable. To forgive means pardoning the unpardonable. Faith means believing the unbelievable. Hope means hoping when everything seems hopeless"
"Tradition means giving votes to the most obscure of all classes, our ancestors. It is the democracy of the dead. Tradition refuses to submit to that arrogant oligarchy who merely happen to be walking around"
"True contentment is a thing as active as agriculture. It is the power of getting out of any situation all that there is in it. It is arduous and it is rare"
"We are justified in enforcing good morals, for they belong to all mankind; but we are not justified in enforcing good manners, for good manners always mean our own manners"
"We call a man a bigot or a slave of dogma because he is a thinker who has thought thoroughly and to a definite end"
"You can never have a revolution in order to establish a democracy. You must have a democracy in order to have a revolution"
"Youth is the period in which a man can be hopeless. The end of every episode is the end of the world. But the power of hoping through everything, the knowledge that the soul survives its adventures, that great inspiration comes to the middle-aged"
"A businessman is the only man who is forever apologizing for his occupation"
"A good novel tells us the truth about its hero; but a bad novel tells us the truth about its author"
"A man does not know what he is saying until he knows what he is not saying"
"A man who says that no patriot should attack the war until it is over... is saying no good son should warn his mother of a cliff until she has fallen"
"A puritan is a person who pours righteous indignation into the wrong things"
"A radical generally meant a man who thought he could somehow pull up the root without affecting the flower. A conservative generally meant a man who wanted to conserve everything except his own reason for conserving anything"
"A stiff apology is a second insult... The injured party does not want to be compensated because he has been wronged; he wants to be healed because he has been hurt"
"A teacher who is not dogmatic is simply a teacher who is not teaching"
"A yawn is a silent shout"
"All architecture is great architecture after sunset; perhaps architecture is really a nocturnal art, like the art of fireworks"
"All conservatism is based upon the idea that if you leave things alone you leave them as they are. But you do not. If you leave a thing alone you leave it to a torrent of change"
"All slang is metaphor, and all metaphor is poetry"
"An adventure is only an inconvenience rightly considered. An inconvenience is only an adventure wrongly considered"
"An inconvenience is an adventure wrongly considered"
"And they that rule in England, in stately conclaves met, alas, alas for England they have no graves as yet"
"And when it rains on your parade, look up rather than down. Without the rain, there would be no rainbow"
"Art consists of limitation. The most beautiful part of every picture is the frame"
"Education is simply the soul of a society as it passes from one generation to another"
"The only way of catching a train I have ever discovered is to miss the train before"
"There are no rules of architecture for a castle in the clouds"
"Women prefer to talk in twos, while men prefer to talk in threes"
"Do not free a camel of the burden of his hump; you may be freeing him from being a camel"
"Half a truth is better than no politics"
"The honest poor can sometimes forget poverty. The honest rich can never forget it"
"The most dangerous criminal now is the entirely lawless modern philosopher. Compared to him, burglars and bigamists are essentially moral men"
"The whole object of travel is not to set foot on foreign land; it is at last to set foot on one's own country as a foreign land"
"There is no such thing on earth as an uninteresting subject; the only thing that can exist is an uninterested person"
"What people call impartiality may simply mean indifference, and what people call partiality may simply mean mental activity"
"Experience which was once claimed by the aged is now claimed exclusively by the young"
"If you do not understand a man you cannot crush him. And if you do understand him, very probably you will not"
"Journalism is popular, but it is popular mainly as fiction. Life is one world, and life seen in the newspapers is another"
"The word "good" has many meanings. For example, if a man were to shoot his grandmother at a range of five hundred yards, I should call him a good shot, but not necessarily a good man"
"If I had only one sermon to preach it would be a sermon against pride"
"There is a road from the eye to heart that does not go through the intellect"
"Fable is more historical than fact, because fact tells us about one man and fable tells us about a million men"
"Without education we are in a horrible and deadly danger of taking educated people seriously"
"It is not funny that anything else should fall down; only that a man should fall down. Why do we laugh? Because it is a gravely religious matter: it is the Fall of Man. Only man can be absurd: for only man can be dignified"
"Large organization is loose organization. Nay, it would be almost as true to say that organization is always disorganization"
"The object of opening the mind, as of opening the mouth, is to shut it again on something solid"
"The only defensible war is a war of defense"
"The way to love anything is to realize that it may be lost"
"Cruelty is, perhaps, the worst kid of sin. Intellectual cruelty is certainly the worst kind of cruelty"
"Happiness is a mystery, like religion, and should never be rationalised"
"It isn't that they can't see the solution. It is that they can't see the problem"
"Nothing is poetical if plain daylight is not poetical; and no monster should amaze us if the normal man does not amaze"